This comprehensive reference takes the Incredibly Easy approach to one of the most demanding and complex areas of nursing. 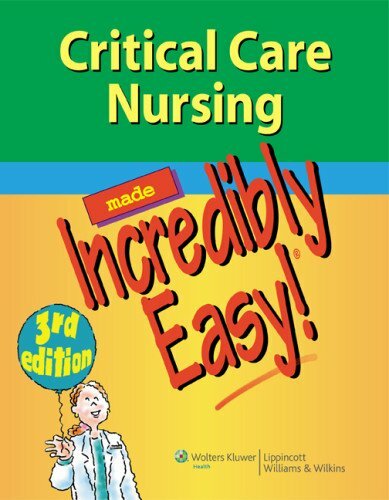 Covering all aspects of critical care and updated to reflect current evidence-based nursing practice, this new edition offers coverage of moderate sedation and perianesthesia management, updated ACLS and code management, information on rapid response teams, and a new “Handle With Care” icon to identify concerns and actions relating to elderly, pediatric and bariatric patients. It also includes a quick reference comparing the types of shock, as well as access to online case studies to improve critical thinking skills, an NCLEX tutorial, test-taking strategies, and over 1,000 NCLEX-style questions.